1. 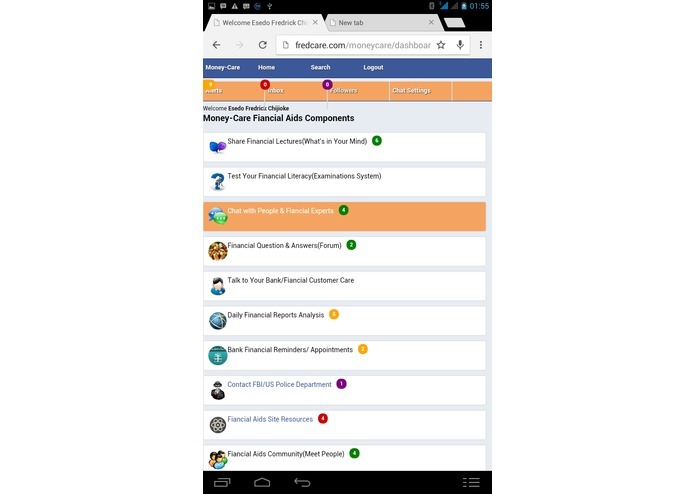 )The MoneyCare app could be accessed using Computer and Desktop system using either Google Chrome or Mozillla Firefox Browser only. 2. 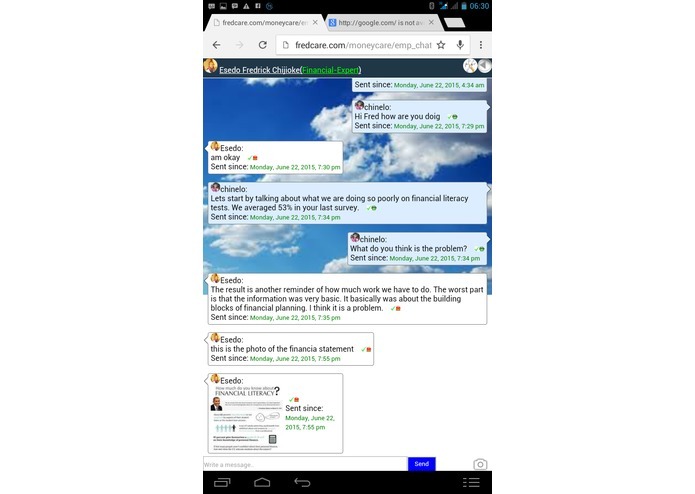 )The app has also been tested and it works 100% including the chat system on IOS, ANDROID and WINDOWS Phone. B.) Coding of Whatsapp like Chat Systems to allows one to one chat communications and Picture sharings for both Web, Desktop and Mobile Apps Devices. 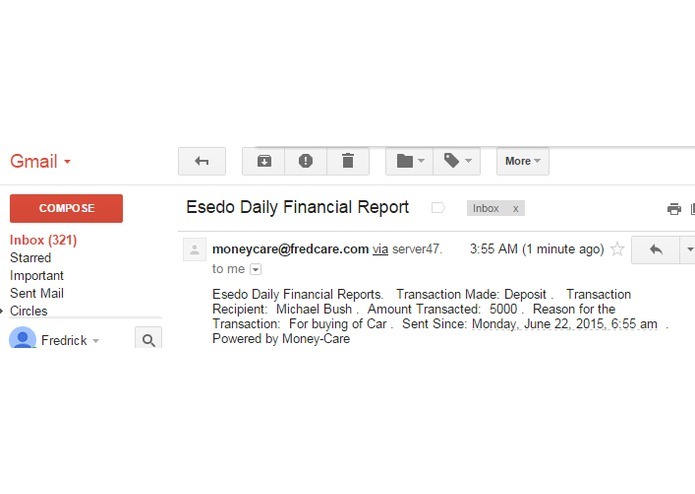 C.) Coding of Financial Appointment Reminders that sends appointment notifications alerts based on configured Date and Time via Email and SMS components. D.) Diabetic Excercise timing System that send Diabetic Excercise info to her Doctor. E.) Coding of Financial Quiz/Examination System. f.) Coding of Local Banking System that enable Users to manage her money as if its in the live bank via Money Deposits, Withdrawal and Transfer System. Being Financially Literate is the best thing that can happen to anyone. It will enable people to Properly manage their Money, businesses and properties. Financial literacy is at its most simplest an understanding of how money works and the ability to make informed and effective decisions about personal resources. 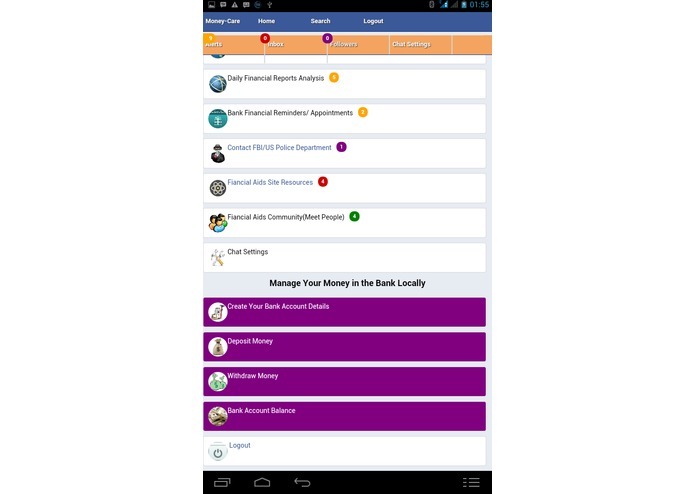 Finally, knowing how to manage your Money in the live Bank Account locally (virtually)within the app will help the user to learn how to setup business account, carry out other business/banking transactions via Local monitoring of Account Balance, Money Deposits, Withdrawal and Transfer to and from different accounts. 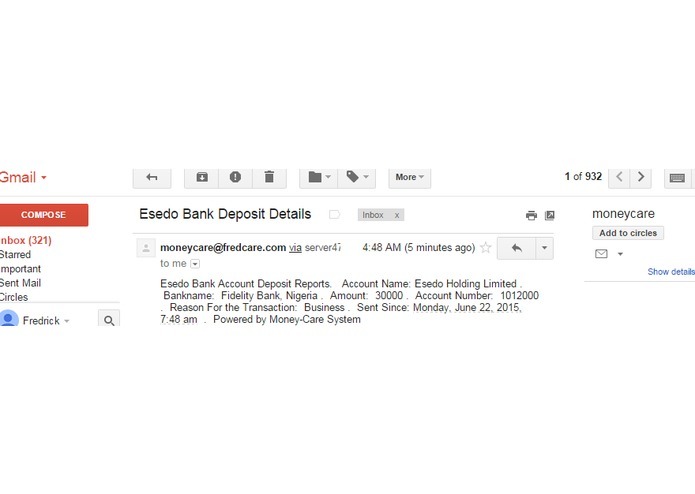 All this transactions are automatically sent and saved in the Users Email Address for Live Business/Bank Account monitoring, documentation and for future references. 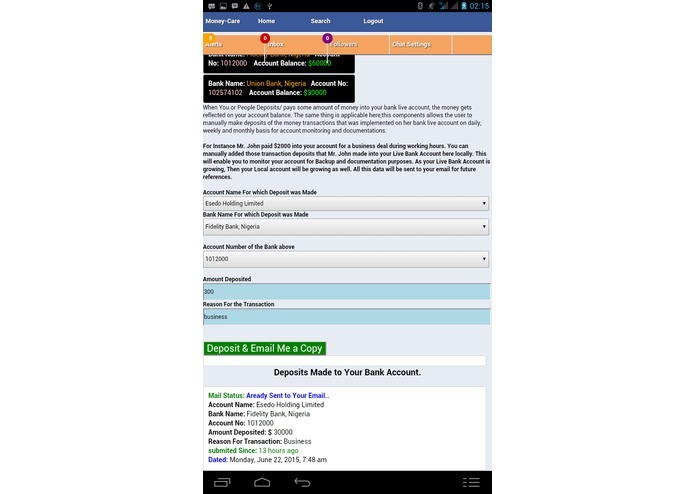 Your Bank keeps the records of Live account, you too will also keep your account records locally/ or virtually within the app. I will show you what this app is upto in the app description below. 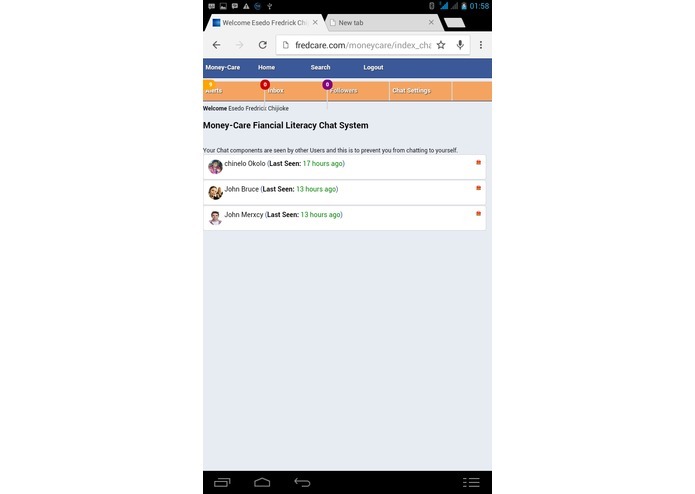 This components enable users to share, lecture and educate one another on fiancial literacy, like how to open a bank account, manage your money,deposit and withdraw money,financial literacy via Share status, Picture display and Video contents. Every user can comment and like the updates. Are you—or your spouse or your teen or your parents—among the financially illiterate? Take this short quiz to assess your financial literacy. Sometimes we can think that because we earn relatively large amounts of money , we automatically knows how to manage our finances. However, there is a big difference between having money and being able to make that most out of it to guarantee your future. With rising levels of personal debt in the world it has never been more important to educate oneself. A first step might be to find out how much you know, or don’t know, by taking our financial literacy quiz below. A score of 6 out of 10 or more shows that you already know quite a bit, less than 6 and you better start swotting. A Bank/Account Customer Care is the one who helps you to manage or take care of your Money. A Bank/Customer Care may be from any bank which you are operating and must be well known to you and must have been appointed by you to help you manage your bank account. 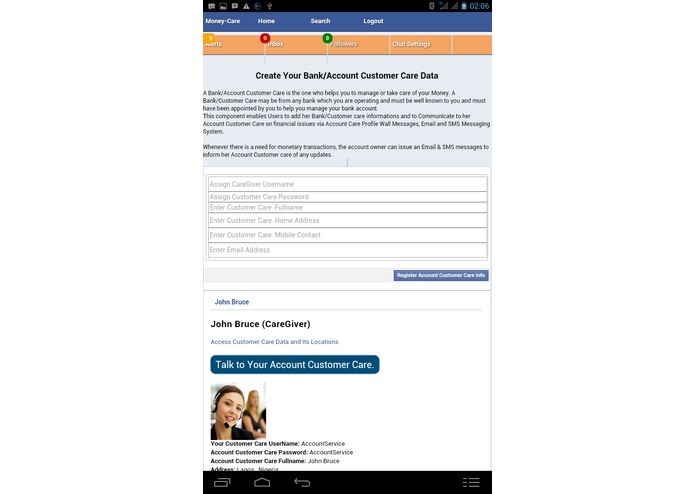 This component enables Users to add her Bank/Customer care informations and to Communicate to her Account Customer Care on financial issiues via Account Care Profile Wall Messages, Email and SMS Messaging System. Whenever there is a need for monetary transactions, the account owner can issue an Email & SMS messages to inform her Account Customer care of any updates. Your Bank are taking their own record of your money, you too can also keep record of all monetary transactions within your account just like bankers do. This components enables Users to access and Manage her Daily Financial Reports such as the amount of money that was deposited into her account, Amount withdraw-ed and Amount she transferred from her account to other peoples account along with detailed information's. 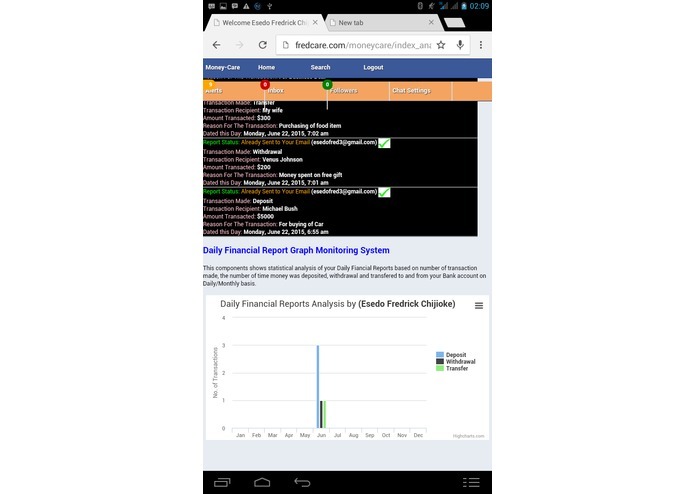 This financial reports were aggregated together to generate a daily Financial graph for Data Analysis. 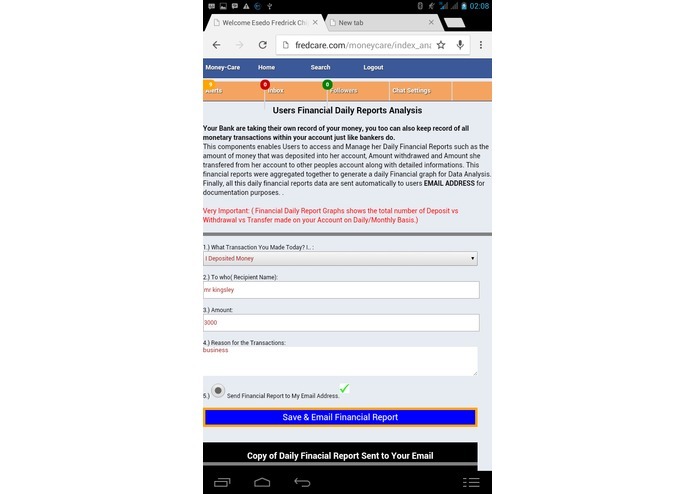 Finally, all this daily financial reports data are sent automatically to users EMAIL ADDRESS for documentation purposes. . 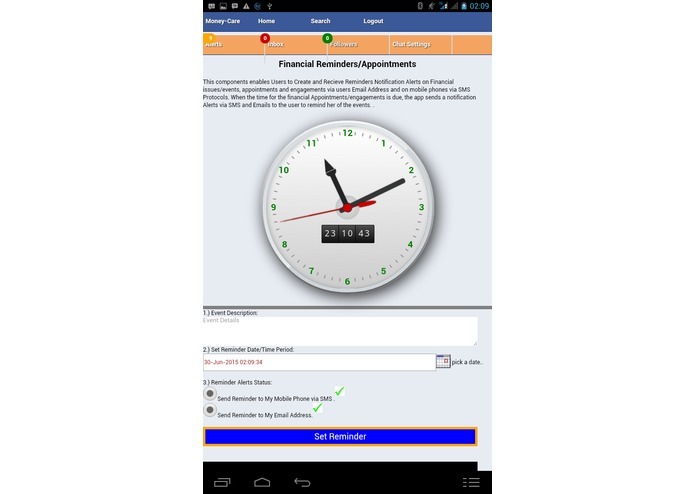 This components enables Users to Create and Recieve Reminders Notification Alerts on Financial issues/events, appointments and engagements via users Email Address and on mobile phones via SMS Protocols. 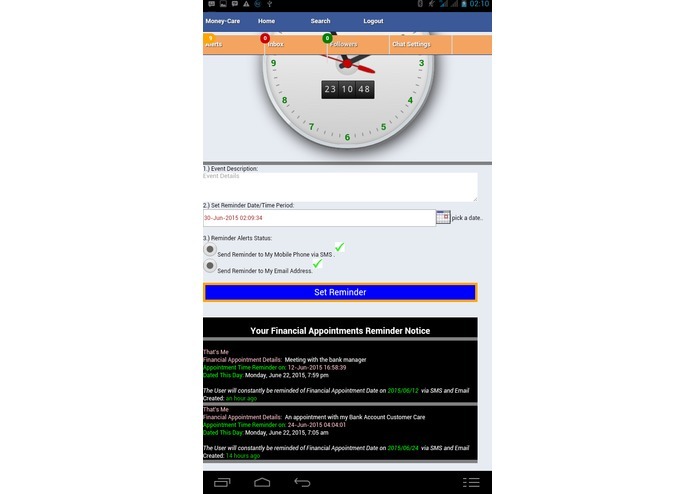 When the time for the financial Appointments/engagements is due, the app sends a notification Alerts via SMS and Emails to the user to remind her of the events. . In the event of Emergency, Fraud and Security needs,a User can automatically send an SMS Emergency Message to US Police Department to inform them of any Bank fraudlent or Critical situation. The app will automatically pick your Name, Mobile contact & Geo-locations via Longitude and Latitude in other to map you on Google map for easy location and immediate response by the FBI or US Police Department. 9.) 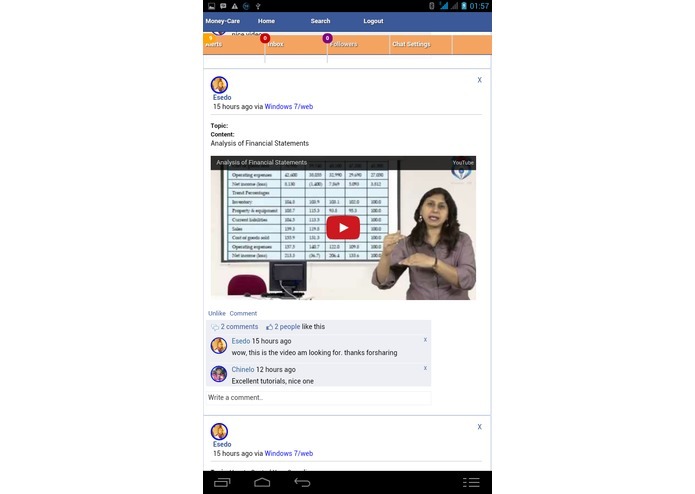 Fiancial Literacy Website Resource System. 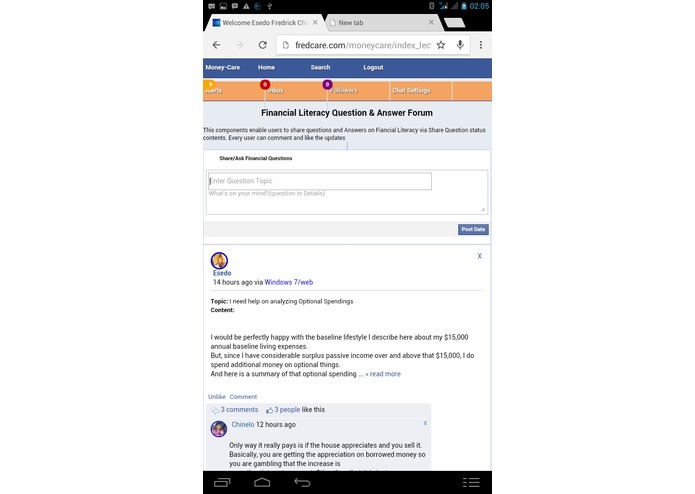 This components provides Users with all available Financial Literacy Sites, Financial Literacy Social Networking sites and Blogs where Users can access to get information's, ask questions, join other Financial Literacy Networking Community to assist one another and to share contents. 10.) 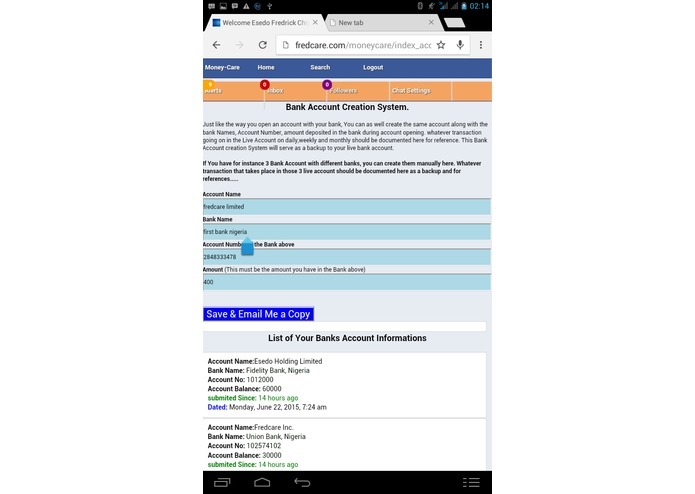 Bank Account Creation System. 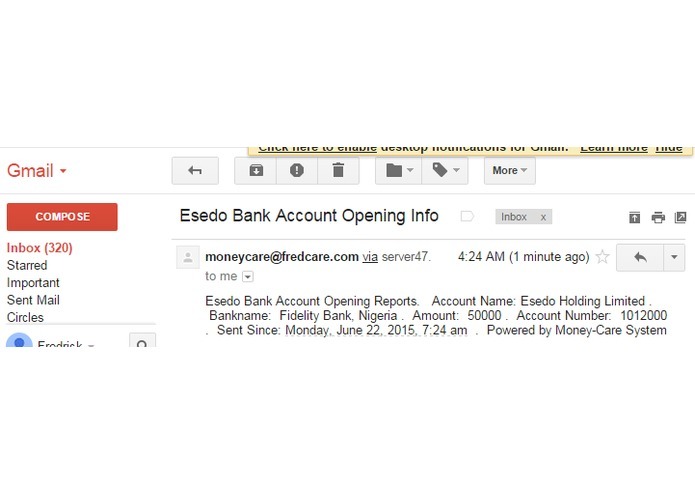 Just like the way you open an account with your bank, You can as well create the same account along with the bank Names, Account Number, amount deposited in the bank during account opening. whatever transaction going on in the Live Account on daily,weekly and monthly should be documented here for reference. 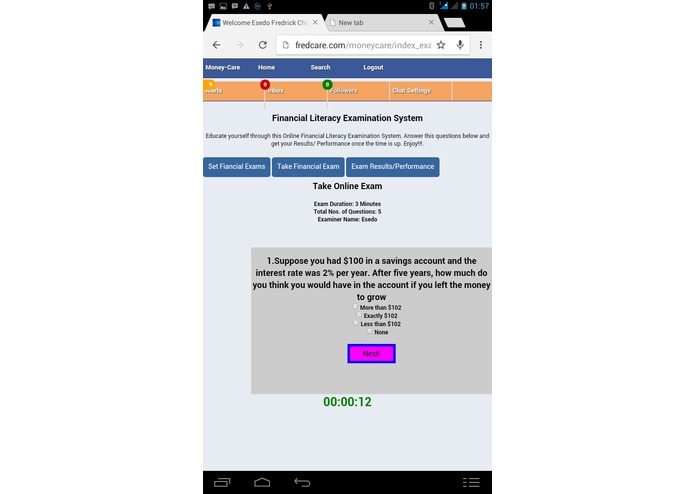 This Bank Account creation System will serve as a backup to your live bank account. 11.) 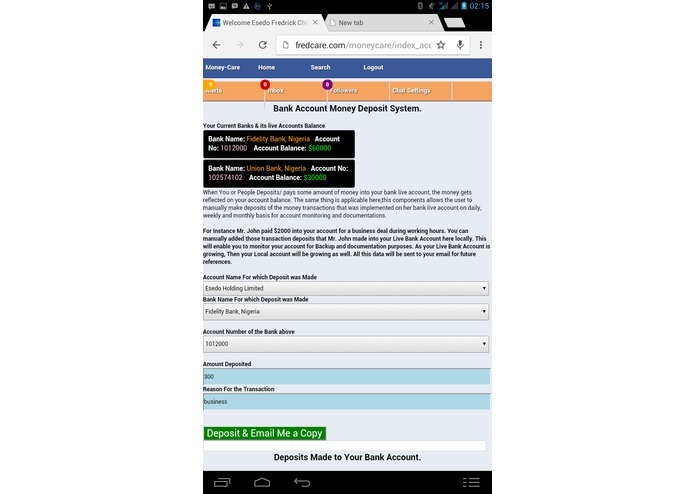 Money Deposit, Withdrawal & Transfer. When You or People Deposits/ pays some amount of money into your bank live account, the money gets reflected on your account balance. The same thing is applicable here,this components allows the user to manually make deposits of the money transactions that was implemented on her bank live account on daily, weekly and monthly basis for account monitoring and documentations. For Instance Mr. John paid $2000 into your account for a business deal during working hours. You can manually added those transaction deposits that Mr. John made into your Live Bank Account here locally. This will enable you to monitor your account for Backup and documentation purposes. 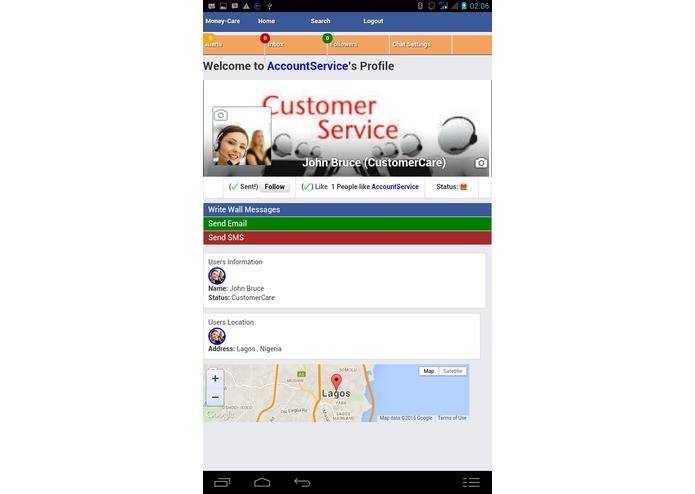 As your Live Bank Account is growing, Then your Local account will be growing as well. All this data will be sent to your email for future references.